Registered to ISO 9001 since 12-24-97.
to ISO 9001:2015 (ANAB) by National Quality Assurance, USA. 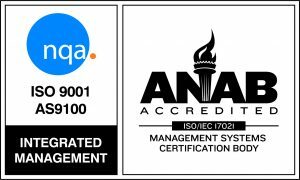 to AS9100:2016 (ANAB) by National Quality Assurance, USA. Contract Reviews: Performed by the Program Management team and Engineering working with the customer to determine needs. QC: Assessments are performed on products throughout the manufacturing process, from incoming inspection to final inspection and test. Quality engineers are assigned to specific programs. Six Sigma Black Belt techniques are implemented on specific programs. Non-Conforming Material: Handled in accordance with our ISO level 2 procedures. Includes identification, segregation, root cause analysis, and corrective and preventive action review, both at floor level and by the Corrective Action Team that meets weekly. Employed in addition to controlled drawings and travelers. Dedicated fixtures and tooling. Traceable calibration. Material control through MRP. Approved vendor list and vendor rating system in operation. Vendor source inspection maintained. Industrial engineer reporting to ergonomic, ESD and process control issues.